Gurgaon-based Yatra Online Pvt Ltd, one of the top three online travel agencies (OTA) in India, has raised funds to the tune of Rs 200 crore to rev up its hotels and holiday booking business. The funding round is led by San Francisco-based Valiant Capital Management, with Norwest Venture Partners and Intel Capital participating as well. Yatra has previously raised a total of Rs 150 crore from Norwest Venture Partners, Reliance Capital, Network 18 and Intel Capital, the strategic investment arm of chipmaker Intel. So far, the company has invested in brand building, acquisitions and rolling out its offline stores. This is a pre-IPO round and there will not be a further round of funding by Yatra, which plans to go public in 2013. It will be used to expand Yatra's holiday and hotel booking services by means of an acquisition. Currently, Yatra offers bookings for over 3,800 hotels in 336 cities across India and over 90,000 hotels around the world. "Today, the hotels and holiday segment is very fragmented and there is a huge opportunity with customers evolving from booking flights to hotels," said Dhruv Shringi, co-founder and CEO, Yatra, speaking to Techcircle.in. "This round of funding will enable us to broaden our reach and brand awareness in tier two and tier three towns, which are experiencing tremendous growth in e-commerce. In addition, we will use the funds to accelerate our expansion in the hotels and holidays segments," he added in a media statement later. Shringi said the company has not finalised an acquisition but the target is likely to be a domestic company. This is different from acquisitions of international travel firms in order to expand their geographical reach, which Makemytrip and Cleartrip are keen on. "India represents a great opportunity for us," says Shringi. "When we made a seed investment in Yatra.com in 2006, the online travel market in India was still at a nascent stage, but there was a tremendous need for innovation in this sector. We were confident that Yatra.com was at the forefront of the changing face of travel in India and the company was poised for tremendous growth," said Promod Haque, managing partner at Norwest Venture Partners and Yatra chairman and board member. The shift to hotel bookings mimics rival and NASDAQ-listed MakeMyTrip's increased focus on hotel bookings, as well as Cleartrip's focus for the year ahead. MMT acquired 79 per cent stake in Singapore-based travel agency Luxury Tours & Travels Pte for $3 million to expand to its business to Hong Kong, Thailand and Malaysia. In October, 2010, Yatra acquired New Delhi-based Travel Services International for an undisclosed sum and entered into the ticket consolidation space. Last year, Yatra spent Rs 50 crores in various activities including branding and its offline storefronts. It will continue to invest in branding to woo users in tier-2 and tier-3 cities. Sudheer Kuppam, Managing Director, Intel Capital Asia Pacific said in a statement, "We believe travel will continue to be the dominant e-commerce segment and leads growth of online transactions in the tier 2 and 3 cities in India. This investment is aligned with Intel's strategic objective of increasing broadband penetration in India through fostering entrepreneurship in compelling content and e-commerce opportunities." The OTA has a countrywide network of Holiday Lounges and Yatra Travel Express stores, and will be adding 16 more stores this year. So far, hybrid (offline-online) strategy has worked out well for the company, with sales doubling year on year from the offline stores, according to Shringi. 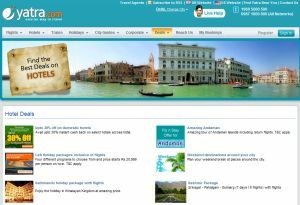 Yatra was launched in August, 2006, and competes with Cleartrip.com and Via.com. Cleartrip has received an investment of $40 million from NASDAQ-listed travel management solutions provider Concur for a minority stake and a marketing partnership. On the other hand, Via is attempting to raise $100 million for global expansion. According to the industry body Internet and Mobile Association of India (IAMAI), the 2010 online travel market in the country was at Rs 25,258 crore gross merchandise value and it is growing at 50 per cent. The subcontinent is beckoning global players, with the likes of Expedia's Hotels.com, which is also increasing its hotel inventory in the country. Hotels.com offers bookings for 2,300 hotels in India and is adding to this at a fast clip, according to Abhiram Chowdhury, marketing director for Hotels.com brand in India and across Asia at Expedia Inc.